Known for it’s glamorous casinos and luxury hotels, Macau is certainly the place to go for a five star experience. However, if you want real exposure to Macau without doing what everybody else does, read about the 5 unique things we did and you can do too to make your travel experience richer. 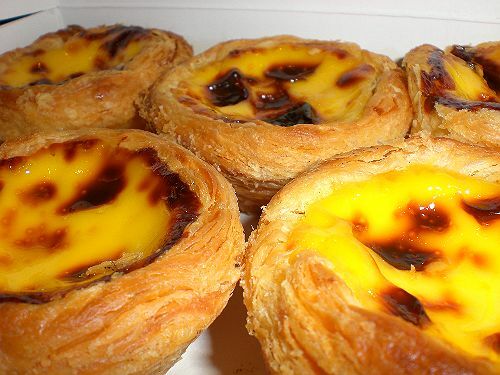 The famous Portuguese egg tart. Yummy! As you may or may not know, Macau was confirmed a Portuguese territory in the late 1800’s after being colonised during the 1500’s. Despite being handed back to China in 1999, Macau has managed to keep it’s Portuguese heritage nicely in tact. One of the ways you will see this is through the delectable cuisine. If you pop into one of the many bakeries, cake shops or delicatessens scattered along the streets of Macau, grab yourself one of the small tarts usually located at the front of the shop. Served warm, these puff pastry cups, filled with a sweet egg mixture (despite the oddness of the concept) are an absolute delight. At a low cost of Macau $9 (approx. $1.30) each, you’re able to treat yourself to something deliciously different. One egg tart each and our day of sightseeing was set off to a flying start! 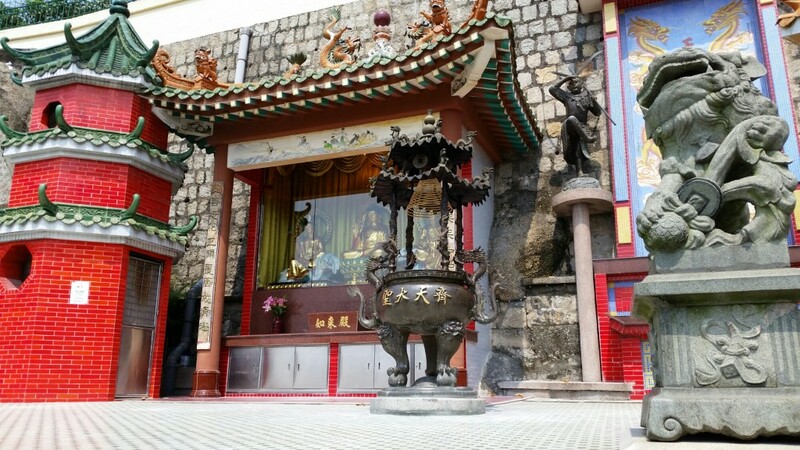 Pictured above is a street view of Kuan Tai Taoist Temple (Sam Kai Vui Kun), located nearby the old Chinese bazaar area. As we ventured closer, we were intrigued by the unique architecture and had to explore further. Wrapping my scarf around my bare shoulders, we stepped inside. And how beautiful it was. We had been in temples throughout South East Asia many times before but there was something so unique about this place. With incense burning above us and candles lit throughout, we both felt completely at peace, which was really nice after a week in Hong Kong. Take some time to yourself while you are inside the temple, soak in the unique experience and let your mind de-stress. 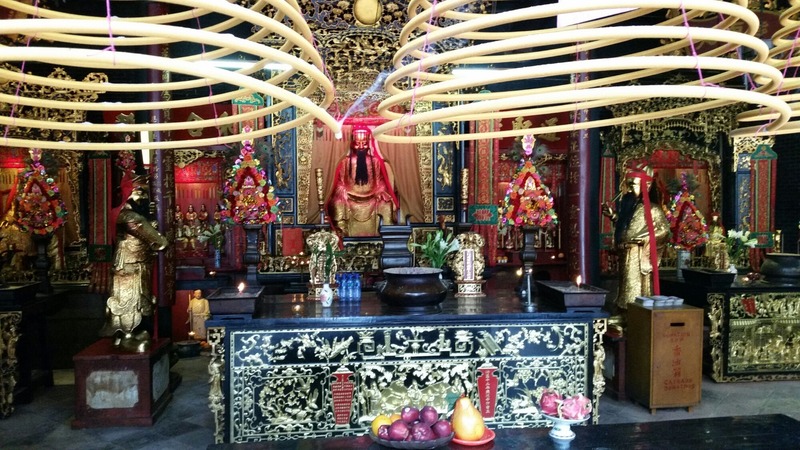 If Kuan Tai Temple sounds like somewhere you’d like to visit, bus routes 3, 4, 6A, 8A, 18A, 19, 26A, 33 and N1A will take you there. Visiting hours are between 8am and 6pm. 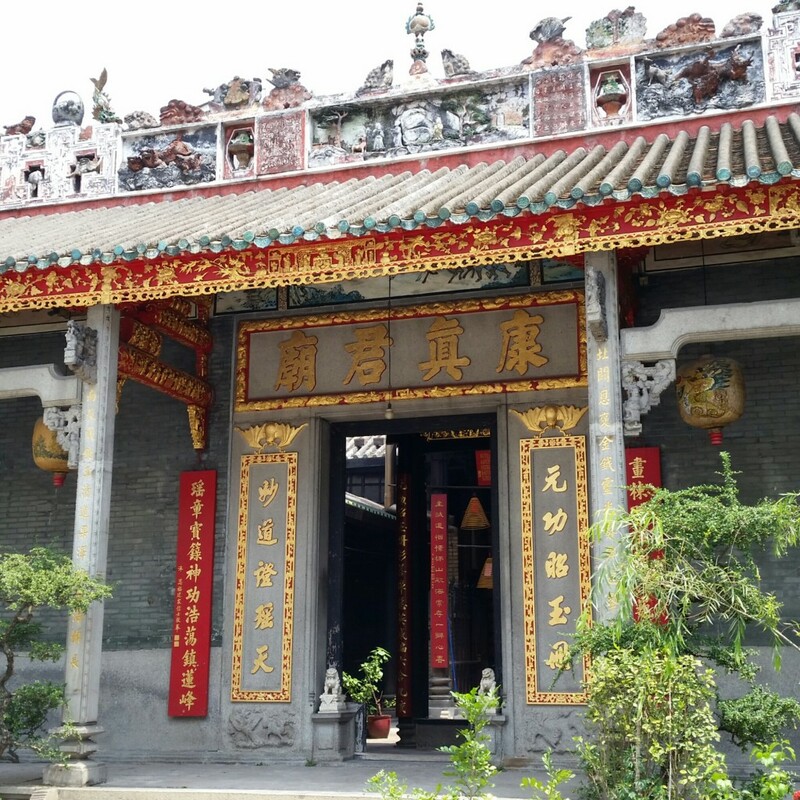 Some other temples to visit in Macau include the A-ma Temple in Barra Square, Lin Fung in Avenida do Almirante Lacerda, Pou Tai Un on Taipa Island, Kun Iam Tong at Avenida do Coronel Mesquita, Lin Kai Miu at Travessa da Corda, Tam King Miu at Avenida de Cinco de Outubro, Largo Tam Kong Miu, Coloane and Na Tcha Temple, next to Ruins of St. Paul’s Cathedral. Remember, if you plan to visit any of these temples dress appropriately – no short skirts/shorts or tops that reveal shoulders, chest or midriff. I didn’t know we would be visiting a temple so I wore a top that showed my shoulders. Luckily, I had my scarf to throw over my shoulders because even out on the streets I was getting some looks. Spontaneously arriving at the Escada Do Papel, we were positively surprised by how easy it is to come across the unique sights of Macau when you go by foot. We recommend skipping the taxi to anyone looking to see more of what the city has to offer and get walking! When we arrived at the top of the stairs, we were captivated by the view and feeling energised and refreshed. This is a great place to relax, capture some photos and listen to the nature, away from all the noise in the city centre. This is another great place to experience something different. Find this beauty at Praça de Luís de Camões, Macau. As we ventured onwards, we found ourselves becoming more and more immersed in nature. 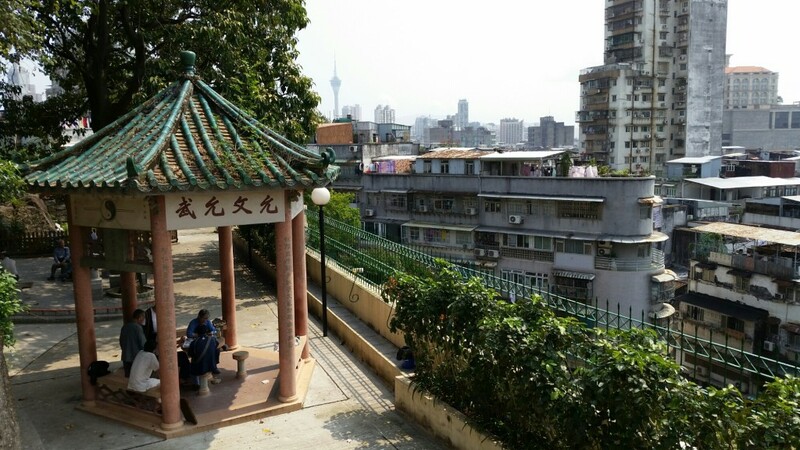 The city became an oasis of banyan trees, plants and wildlife where people were up to all kinds of activities – relaxing, meeting friends, practicing Tai chi, playing chess and even taking their caged pets for a walk. 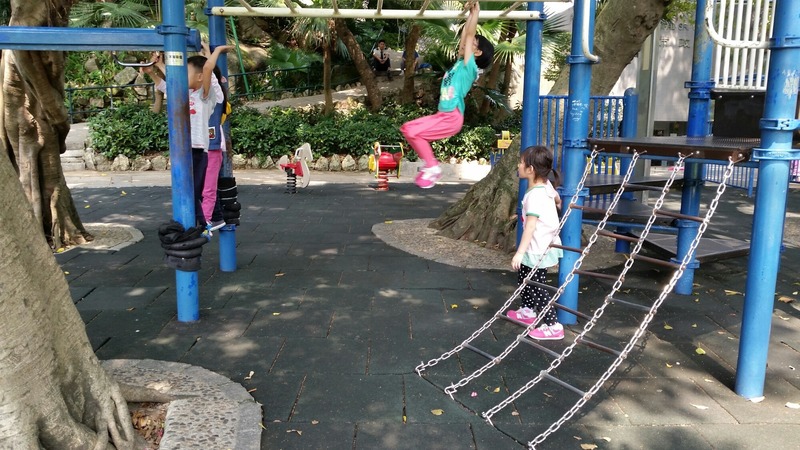 The children were also enjoying themselves in the nearby playground. 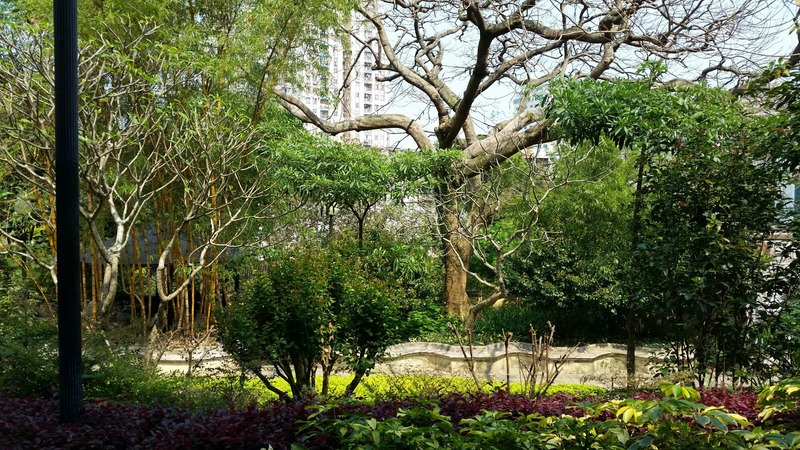 Named after the Portuguese national poet, Luís de Camões, this garden is the largest and one of the oldest in Macau. Buy your lunch before arriving and enjoy a picnic amongst the gardens’ luscious surroundings. 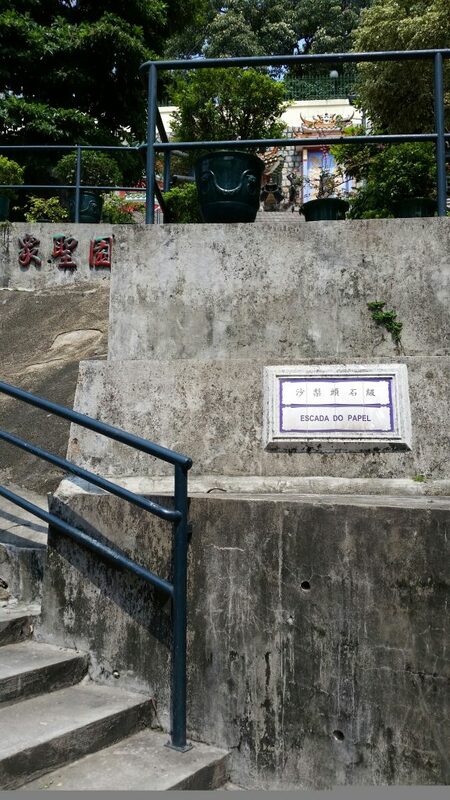 To find Luís de Camões Garden, head to Praça de Luís de Camões, Macau. The closer we were getting towards the Triangular Da Areia Preta Garden, the louder a particular drumming sound was becoming. Upon arrival, we headed to the large pavilion centred in the park to find out what this noise was all about. 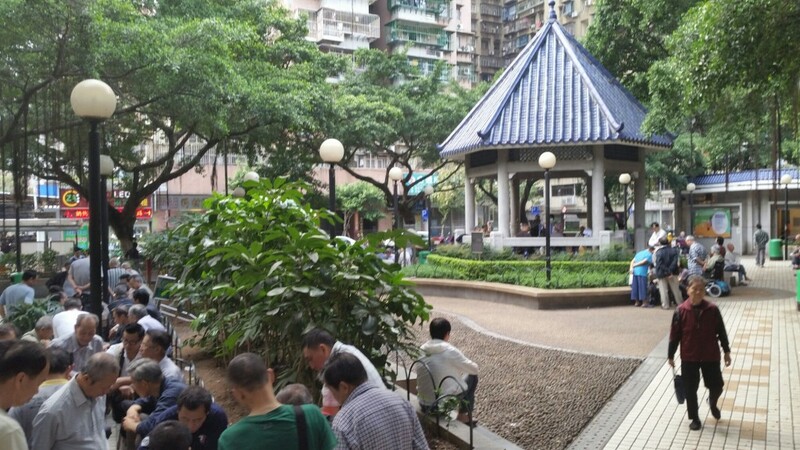 It was then that we noticed 7 elderly locals amongst the middle of a small crowd, playing traditional Chinese music for the people in the park. How lovely! A man and woman sang for us while 5 men each played the saxophone, the ruen (a Chinese plucked instrument similar looking to the banjo), the two string Chinese fiddle (an instrument that dates back to around 5000 years ago), the Pipa (similar to the 2 string fiddle) and percussion. The park was filled with many people (mainly elderly) enjoying the music while going about their weekend activities which included knitting, cross – stitching, exercising, playing chess and making use of the free government WiFi. There was even an elderly woman giving free haircuts (which I was nearly roped into having)! We thoroughly enjoyed it and we believe this is something really unique to see! Find this park at Estrada do Arco. If your legs are too tired by this point there are local buses that go here. Personally though, we enjoyed walking and getting lost in Macau alleyways all the way back to our hostel. Well there we go folks, our personal guide to 5 unique and off the beaten path things to do while travelling in Macau. We hope that we’ve helped you along your journey and we wish you the best of luck! Hannah is an Australian nomad and the Founding Editor of StoryV Travel & Lifestyle. After finishing her studies in Business Administration Hannah took off to Thailand with her father for a life-changing volunteer experience that shaped the way her future panned out. 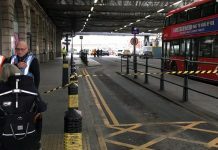 The day she returned home she took up 3 jobs and booked her next ticket out. 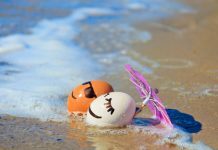 3 months later she had quit the rat race completely and was off to Thailand once more - this time, on her own. Little did she know, that solo adventure would lead her to meet the love of her life and go on to explore the rest of the world as a digital nomad. With a thirst for experiencing unfamiliar cultures in exotic destinations around the world, Hannah most enjoys chasing sunsets, lazing on tropical beaches and getting lost among a myriad of crooked buildings and small alleyways. Follow her adventures on Twitter and Facebook!